Cheick Tiote played for Newcastle United between 2010 and 2017. Cheick Tiote, a footballer who played for the Ivory Coast and Newcastle United in the English Premier League, has died after collapsing during training with his Chinese club Monday. 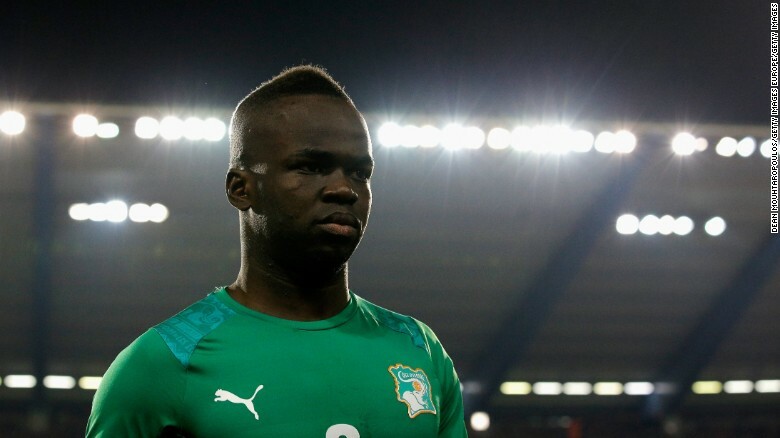 The 30-year-old Tiote, who played in England between 2010 and 2017, joined Chinese second division team Beijing Enterprises earlier this year. "It is with deep sadness that I confirm that my client Cheik Tiote sadly passed away earlier today after collapsing in training with his club Beijing Enterprises," his representative Emauele Palladino said in a text message sent to CNN. "We cannot say any more at the moment and we request that his family's privacy be respected at this difficult time. We ask for all your prayers." Beijing Enterprises said Tiote had been rushed to hospital after collapsing during training but had died at 7pm. "Mr Tiote has made outstanding contributions to the club since joining, and has won over the club, coaching staff and teammates with his superb skills and professionalism," said Beijing Enterprises in a statement. Newcastle manager Rafa Benitez described Tioté as a "true professional." "It is with great sadness that I have learned of Cheick's death," Benitez told the Newcastle website. "In the all the time that I have known him, he was a true professional, dedicated and above all, a great man. Our hearts go out to his family and friends at such a sad time." Tiote played for the Ivory Coast in the 2010 and 2014 World Cups. The midfielder represented his country on over 50 occasions, winning the Africa Cup of Nations in 2015. He was also part of the Ivorian squads at the 2010 and 2014 World Cups. Senegal striker Demba Ba, who was a teammate of Tiote's at Newcastle, offered his condolences on social media. "May Allah gives grant you jannah brother Tiote (sic)," tweeted Ba, who now plays in Turkey with Besiktas. "Very sad to hear about the pass away of tiote. Rip my friend (sic)," posted Jonas Gutierrez, an Argentine who played for Newcastle alongside Tiote. "Goodnight brother, you will be missed," said Papiss Cissé, another former teammate on Tyneside. "My heart goes out to his family. Gone too soon"
Tiote is best remembered for scoring a spectacular, last-gasp equalizer when Newcastle came from 4-0 to draw 4-4 with Arsenal in 2011.